Sometimes Foodie: Ch-Ch-Churro Project 7 Gum: Here We Go Again! 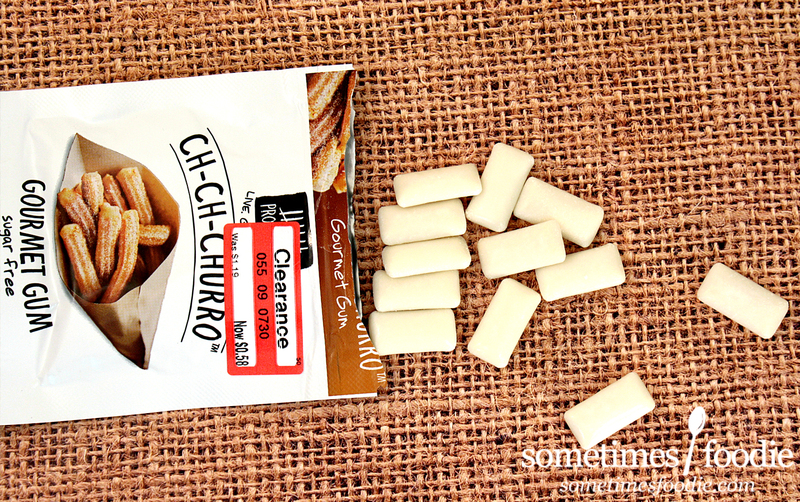 Ch-Ch-Churro Project 7 Gum: Here We Go Again! 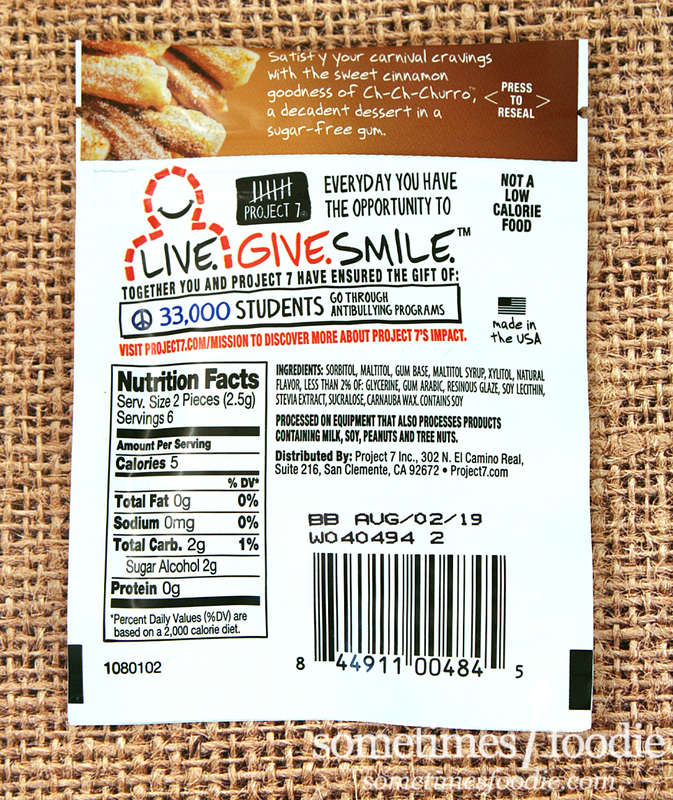 Project 7 offers unique sugar-free sweets in well designed packaging, all while donating proceeds to worthy causes. What's not to like? Sadly, their product. They're just too inconsistent! There are a handful of their chewing gums that I truly enjoy and would recommend to everyone, but for every product I adore, there are easily twice as many disappointments. 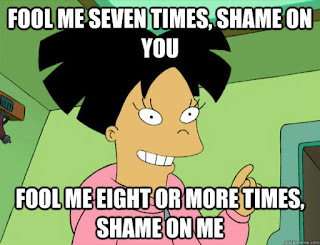 Fool me seven times, shame on you, fool me eight-or more times, shame on me. 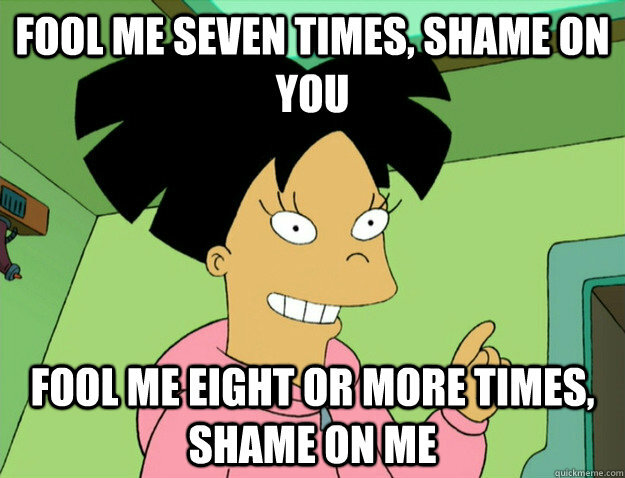 I talk a big game, but I have used this Futurama meme before, in ANOTHER Project 7 review. Even after being burned time and time again, I keep coming back for more...when they're on sale. Wise man say, forgiveness is divine, but never pay full price for roulette chewing gum. It looks like Project 7 is doing a little something different with their packaging. 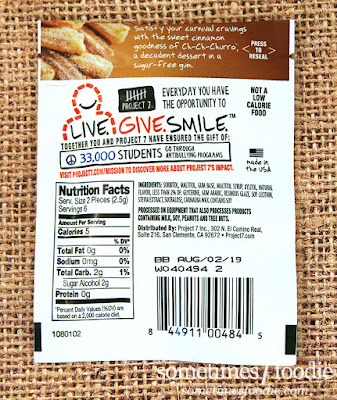 This resealable foiled plastic baggie has a sleek matte finish! The texture feels great in-hand, and it photographs like a dream. Come to think of it, do you guys remember those eco-friendly Sun Chips bags from...SEVEN YEARS AGO?! Oh man, where does the time go? Anyway, they were infamous for being super loud. This is a lot like that material, but thicker. It's pretty loud, but since it's going to be shoved in my purse and munched on at work, that's not an issue for me. Inside the pouch we have several, off-white, pieces of gum that smell like I Can't Believe It's Not Butter mixed with Splenda and cinnamon. My description doesn't sound all that appealing, but it's honestly not that bad. The aroma is a little salty, savory, sweet, and spicy all at once, it's the prevalence of the artificial sweetener that is putting a negative spin on things. I popped a piece into my mouth, expecting the worst, but it was surprisingly enjoyable! Not bad! 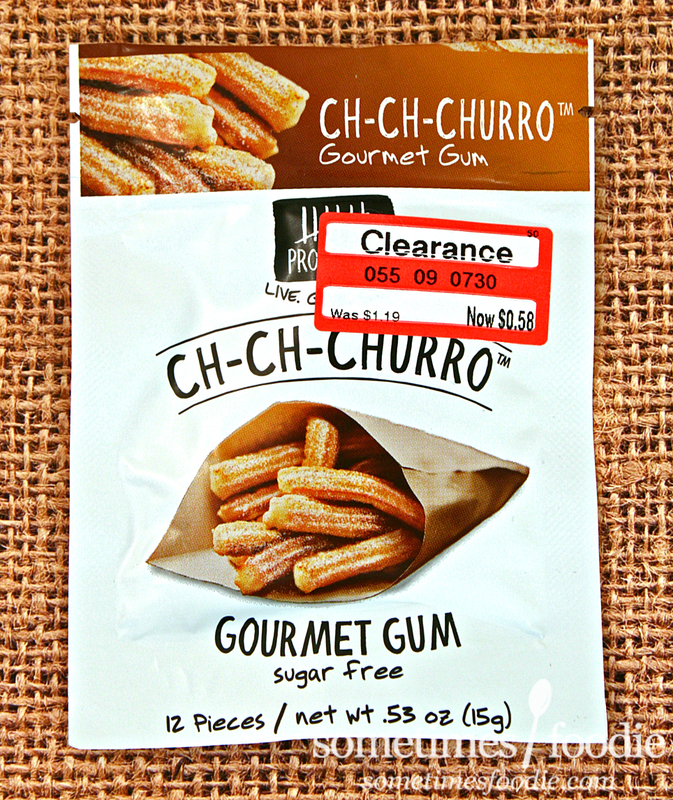 (Especially for only 58¢.) I'm a little torn, because this definitely does not taste like a churro, and after chewing on it for 3-5 minutes, the flavoring fades into bland artificial sugar oblivion, but it's really not half bad. I can't give this a glowing recommendation, but it does give me hope.